November is a month of giving back and giving thanks. Here at the James J. Hill Center, we are thankful for our research services volunteers and interns who are invaluable to our mission of connecting entrepreneurs, business and community. 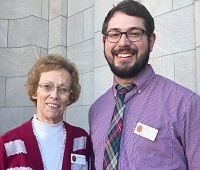 Read on to learn more about our volunteer Sharon Lunak and intern Nick Riordan. Sharon: I was raised on a farm in Wisconsin and moved to St. Paul during high school. I worked for Remington Rand Univac and got married at twenty-one. My husband was a pastor in Wisconsin, and eventually we spent seventeen years in Japan as missionaries with our two children, coming back to the U.S. in 1987. My husband taught college students and I went to work at Jostens for the next twenty-five years. Nick: I am a graduate student in Saint Catherine University’s Masters in Library and Information Science program. Prior to that, I studied Linguistics and Religious Studies at Macalester College. What do you do at the Hill Center? Sharon: I work as a volunteer receptionist two days a week or as needed during special occasions. Nick: My work at James J. Hill Center varies by the day. Sometimes I work at the front desk greeting users and assisting them in operating our business resources, other times I am in the stacks reshelving or rearranging the books, and other times I am working down in the archives. What inspired you to volunteer/intern at the Hill? Sharon: I retired in 2016 and decided I couldn’t sit at home every day. Because my husband gave tours at the Hill House for eight years, it was a good transition for me to volunteer at the Hill Center. Nick: I began interning at the Hill in May 2017 to gain experience and exposure to working in a library and archival setting. Although I was in the process of completing my first year as a library science student, I hadn’t ever worked in a library before. 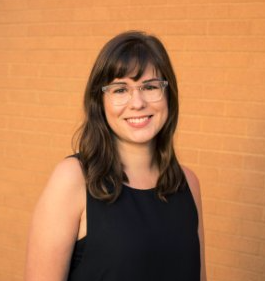 I wanted to see which elements of the profession I liked and which ones I didn’t so I could apply that to my career going forward, and this internship has helped greatly in that regard. What is your favorite part of being a Hill volunteer/intern? Sharon: It’s great working with the Hill Center staff, who are completely dedicated to making the Hill Center the best it can be. I also love the historical setting and enjoy meeting all the different people coming in to do research or visiting the almost-one-hundred-year-old building. Nick: Being around all the old books and the overall stateliness of the library. Sometimes when you’re in the reading room, it’s tempting just to stop, look up, and be in awe! Sharon: I love learning about my great-grandparents coming to the U.S. from Europe (mid-1800s) and my grandparents learning to live in the U.S. (late 1800s), and, of course, making current family history with our five grandchildren. Who is your favorite “Original Thinker”? Nick: John Muir. In a time when nearly everyone in power was looking for ways to exploit America’s natural resources for profit, Muir focused on fighting to preserve them and was the impetus for the current system of state and national parks enjoyed by millions each year. What is your favorite James J. Hill fact? Nick: Hill would travel routes on horseback and determine whether they were suitable for his railroads. It’s crazy to think how hands-on he was in all his business ventures. Sharon: Despite losing sight in one eye when he was young, James J. Hill became an entrepreneur, which led to him becoming a very successful businessman—and leaving the Hill Center as his legacy for all entrepreneurs.